His message was titled "Pentagonin iskuun järkeä", i.e. he was demanding some common sense to (dealing with?) the Pentagon attack. Sure. But what do we have in the other end of the recommended hyperlink? There we find an anonymous article titled "Evidence That A Boeing 757 Really Did Impact the Pentagon on 9/11". And such evidence is offered, among various errors. But it is all indirect (like photos of engine parts inside the Pentagon), and as we are faced with direct evidence to the contrary it is also irrelevant for the main point: does the official story explain the observations that can be made from photos of the Pentagon on 9/11? Let's look at this Really-Did-Impact (RDI) evidence a little more closely.The author starts boldly: "Everything I list here as evidence includes links to sources". Unfortunately, this is not the case, as you will see below. Given the size of the 757, and the size of the Pentagon, the damaged area fits in peftectly with the dimensions of both the aircraft and the building. Sorry but this is just plain nonsense. The top and right edges, in particular, of the hole created in the outer wall of the Pentagon have nothing to do with the size, shape and alleged position of the alleged B-757. [Alleged by the American Society of Civil Engineers (ASCE) in its Pentagon Building Performance Report which fully fails in its attempt to explain the Pentagon damage with the crash of a B-757 (see my article). All the data I use about the alleged crash are from this report unless otherwise mentioned.] These facts are ignored by the RDI author. No wonder. The tail certainly isn't going to punch a hole through a reinforced concrete wall; that is why there is no 40 foot hole in the front of the Pentagon in any photos. A 40 foot object didn't hit it, a 13 foot object did. "The height of the damage to the facade of the building was much less than the height of the aircrafts tail. At approximately 45 ft, the tail height was nearly as tall as the first four floors of the building. Obvious visible damage extended only over the lowest two floors, to approximately 25 ft above grade." But it offers no kind of explanation. Wouldn't it be fair to expect that a theory explains observations. And if it doesn't, no psychological ("I highly doubt..."), emotional ("It can't be!") or political ("Why would they have done it?") speculations should hold us back from discarding such a theory - if we're interested in what happened. 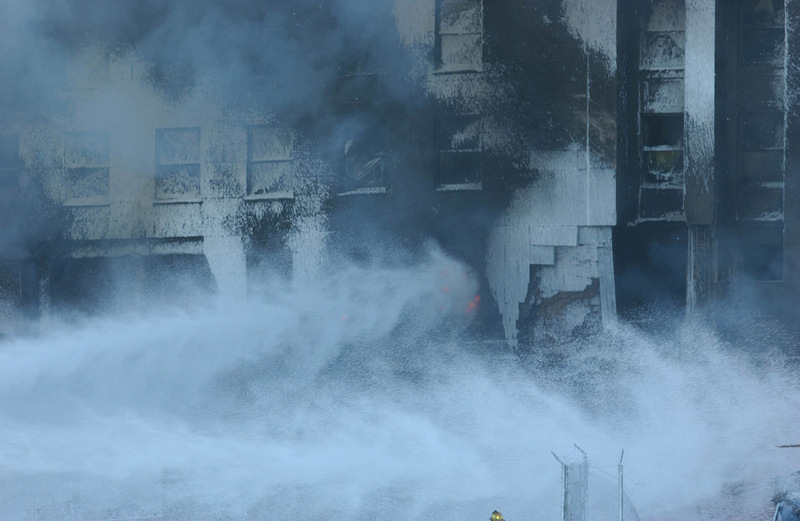 Evidence of the right engine impact on the side of the building is evident on the large pillar being sprayed with fire retardant. I do not wish to hurt the author, but this is an excellent indicator of very poor familiarity with the crime scene. The author has not tried to fit the nose of a B-757 to column line 14 (where the official story puts it) and the right engine to that damage. Do they make jetliners of rubber? Is the author saying the 11900-lb (8.6-ton) engine was severed and changed its course when it hit the generator? Let's calculate a little. We have a 8626-kg engine traveling at a speed of 780 ft/s = 238 m/s. It hits a generator. To end up between column lines 18 and 19 (as suggested by the RDI author) instead of between 16 and 17 (as in the official story) a change of some 8% in its speed vector is required. This equals 18.9 m/s. The impact the engine needs is arrived at by multiplying this by the weight. The result is almost 163 000 kgm/s. Let's say the impact lasts for 0.01 seconds (in which time the engine moves 7.8 ft). The force required to cause the impact is then 16.3 million Newtons (impact/time). This equals 1.7 thousand tons or 3.7 million lbs, the gravitation of more than 192 such engines. How could a generator, weighing certainly no more than a few tons, create such a force? But if the right engine of a 757 hit the front of the generator, part of the wing could gouge the top. This, again shows that whoever wrote this article has not taken much trouble to get the facts straight. Relying on the ASCE's Pentagon Building Performance Report, it can be seen that the aircraft was tilted about 8 degrees to the left as it hit the building. And as the top of the fuselage was at approximately 20 ft, this means that the underside of the right wing, just outside the engine, was at about 14 ft from the ground. That's more than 4.2 meters, and the generator is roughly three meters high. The only part of the right wing that would have hit the fence or the generator is the engine. See figures in my article. Under the title, "Lets look at the physics involved", the anonymous author breaks his/her promise to provide links to original sources. S/he presents a picture from the ASCE report without mentioning where it is from. References are made to the "scientific" study of the Pentagon crash made at the Purdue University. The author talks about "accurate simulation results," but as everyone can understand, no simulation result can be accurate without the input information also being so. And with the Purdue study, this is not the case. Two examples: The Purdue team has moved the fence to some 70 feet's distance from the building and they claim that the aircraft hit the building in a 48 degrees' angle to the normal of the facade. In reality, as can be seen from satellite images, the fence was more than 100 feet away from the facade, and as I have shown in my article, ASCE's 42º (not to mention this 48º) approach angle is incompatible with physical evidence. Most importantly this is because there was just one hole in the fence. Had there been a crash by a B-757, the only possible approach angle would have been about 31º. See my article. If I were to tell you that I've found the tusks of an adult elephant in a large cave with a three-foot opening, and some pieces of skin in front of the cave, would that convince you that the poor animal squeezed itself to the cave? The anonymous author examines ground debris by presenting photographs whose source is not, contrary to the bold promise at the outset, always clear. I will not try to dispute his/her case here. There may or may have not been parts of a B-757 inside the building; that is irrelevant. For it is secondary evidence (as are eyewitness testimonies, taking into account the perception psychology involved), and we have primary evidence that the facade damage is not explainable with an impact by a B-757. And, of course, finding parts of a B-757 is in no contradiction to the claim that no B-757 hit the Pentagon, for the physical evidence available strongly hints at US government complicity. After all, something had to be done to flight 77, and where could it have been hidden without the authorities finding it out?